Jawaan Street, near Sports Roundabout. 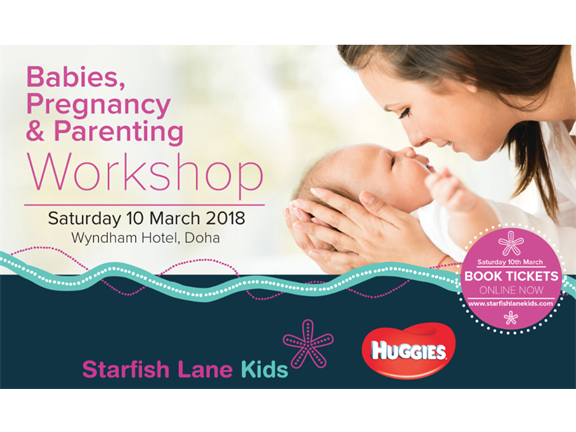 Starfish Lane Kids Nurseries together with HUGGIES, has organised a non-profit, full-day parenting conference for new and expectant parents called "Babies, Pregnancy & Parenting Workshops” on Saturday, March 10th. Eight of Doha’s local experts (pediatricians, obgyns, women who run pre-natal birth classes, pediatric & maternal nurses, pre & post-natal care and breastfeeding experts, wellness coaches & doulas, women who are specialised in babies and maternal matters) are keen to have the chance to meet with and present to prospective and new parents. WHY? Because when you know better, you do better. It's important to be passionate about your parenting. Fathers should come, listen and learn so they, too, are fully equipped for the next chapter together. Understanding the Science of your Baby’s Sleep. Speaker: Dr Renu Angwin (Paed - TIMC). Top 10 Tips for Transitioning into Parenthood – New Mother & Father’s Roles and Expectations, Post Natal Depression signs etc. Baby’s Milestones: for the First Year. TOTAL TIME: 3 hours FOLLOWED BY LUCKY DRAW PRIZE GIVING! We will have at least 10-20 mins of Q&A after each talk, so parents can have their questions answered by an expert, face to face. The event will be held at the WYNDHAM GRAND REGENCY in Doha (Corner Jawaan & Al Rayyan Road, near Sports Roundabout) on March 10, from 8:30am – 4pm. Young babies (under 12 months) are welcome to this event. However, if your baby starts to fuss and make a noise, you will be expected to leave the room so as not to disturb the speaker and other parents. Strollers and prams will be parked in a separate room because of space issues. We do encourage you to bring fathers / husbands to the afternoon session. It will be non-profit event, we want as many parents to participate. We are so grateful to our sponsors, HUGGIES and Starfish Lane Kids. We are grateful to our speakers for sharing their expertise and knowledge. Our goal is to make this an annual event, every year in early March as part of our CSR. In November 2018, our hope is to hold a similar parent education workshop event, but half day only, on “TODDLER TIME”. Starfish Lane Kids Nurseries is hosting this non-profit "Babies, Pregnancy and Parenting" event as part of our Corporate Social Responsibility and community service to the parents of Doha. We are passionate about parent education and we believe that parent education can change lives, build strong families and communities. Our goal is to connect the experts in Doha with the local and expat population as they raise their babies and children in a foreign land, with all the inherent challenges and rewards. In future we are keen to partner with experts (speakers), any baby brands, retailers or experts who have an interest in community service and parent education relating to these topics. Please send an email to soul.robertson@starfishlanekids.com if you wish to contribute in the future. Starfish Lane Kids is Doha’s biggest and most popular nursery. We have been in Doha for 10 years and have been awarded “Outstanding Childcare Provider” by the Ministry of Social Affairs (2015). Over a thousand happy babies and children have grown, learned, played and developed with us in our 3 Doha nurseries. We have worked hard to establish an excellent reputation here in Doha and have opened another beautiful and successful branch in Khalifa City A, Abu Dhabi. This is the second event of its kind in Doha. I believe we will have great success and we are dependent on mums spreading the word and telling their friends to join them as they register for this event. We will do the same event again in 2019, so more parents can benefit. Please share this event with your friends. It's great to meet new moms!